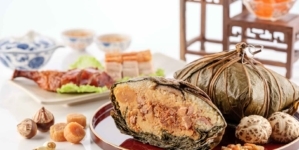 When you talk about an amazing food experience in Bangkok, many Singaporeans will think about amazingly cheap street eats – a delicious mookata, tom yum goong or mango sticky rice. 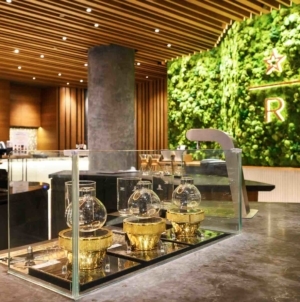 But as many also have begun to find out, Bangkok also offers equally amazing high-end culinary experiences that can be had at a fraction of the cost in Singapore. 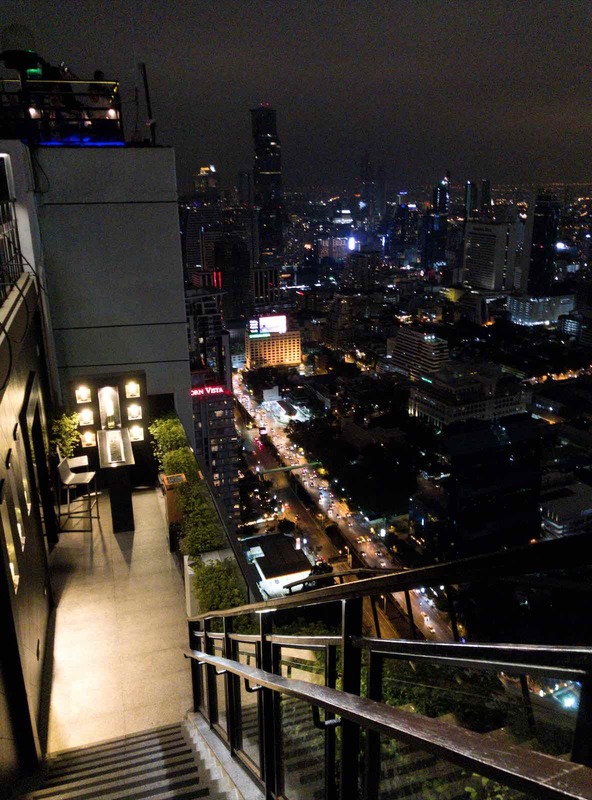 Among the best high-end experiences are its rooftop dining and bar scene like the Vertigo restaurant and Moon Bar. 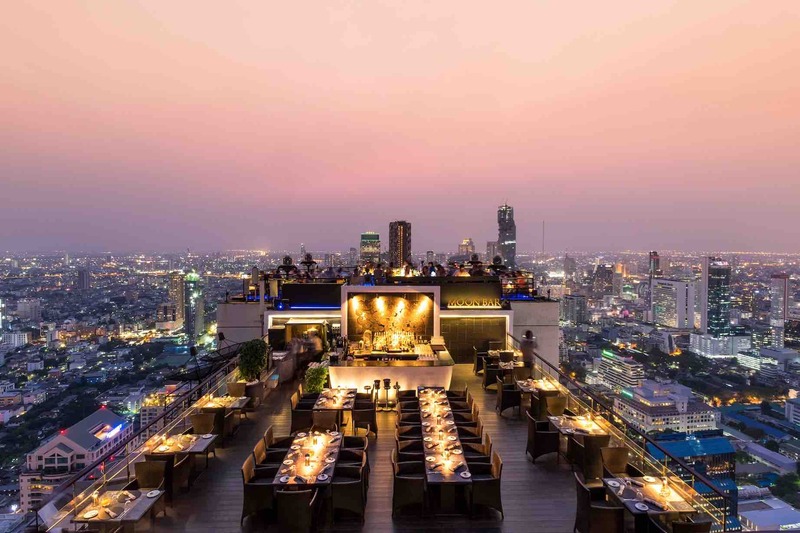 Bangkok skyline is rich in colour and bustling with tremendous energy, and many hotels and buildings have taken advantage of that by placing their premium at the very top. 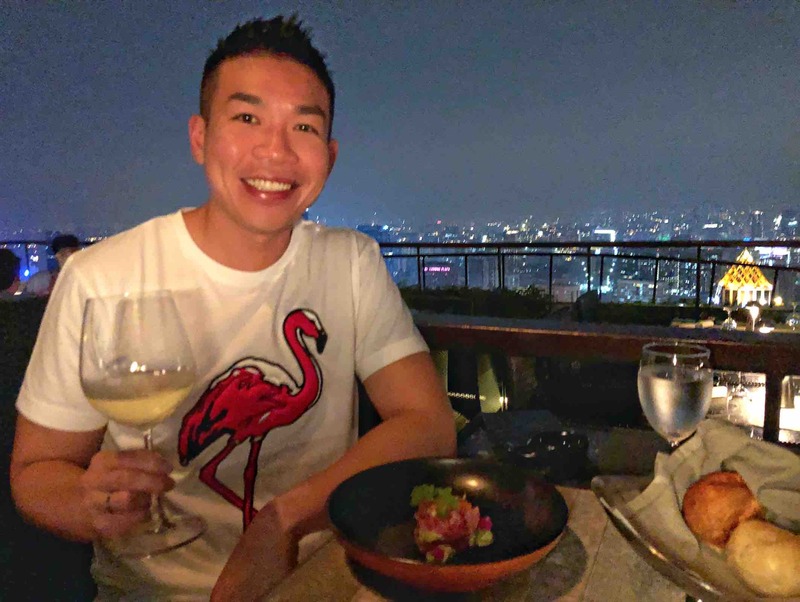 During a recent stay at the Banyan Tree Bangkok, we took the opportunity to dine at one of the very best of those premium experiences – the hotel’s famous Vertigo restaurant and Moon Bar. Standing at 61 floors up, it was built over an unused helipad and makes use of low walls and escalated platforms to offer a near unparalleled view of the city skyline from one of the tallest buildings around. 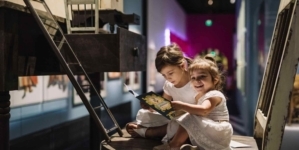 From there, you can see all the famous Bangkok landmarks, including the Grand Palace, the Chao Phraya River, Wat Pho Temple and the Emerald Buddha. 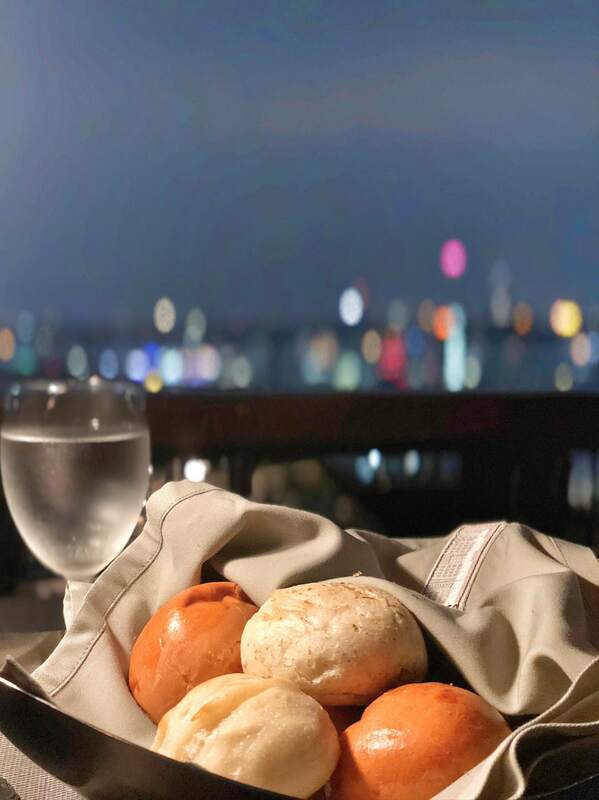 Best of all, the Vertigo restaurant and Moon Bar both have their own dedicated sections for those who want to dine under the stars or casually sip on a cocktail in an alfresco setting. These include the main dining courtyard, a private dining and lounge space that can be reserved for special occasions, and the Moon Bar itself. 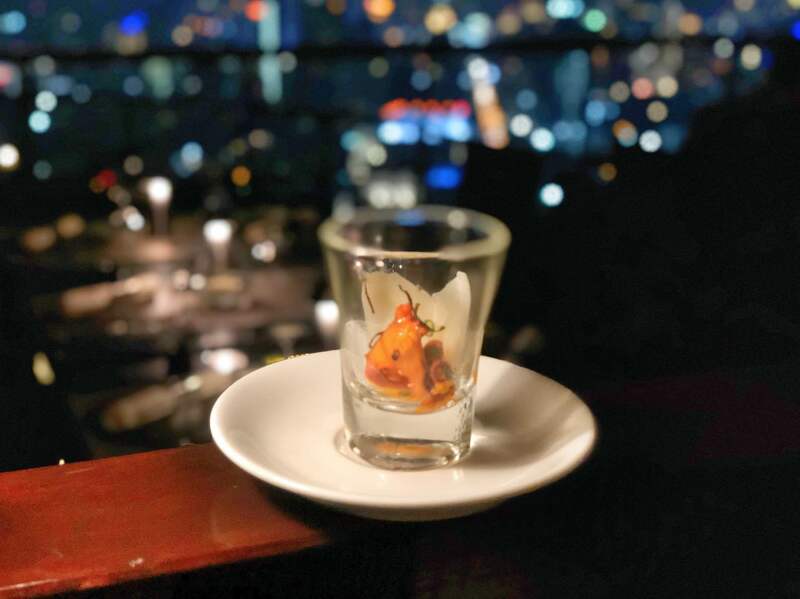 When we went in Sep 2018, part of the Moon Bar was cordoned off for renovation; when re-opened, the management said that the space will include a glass walkway that juts out over the side of the building to let you see the view below with crystal clarity to add on to the amazing skyline experience. 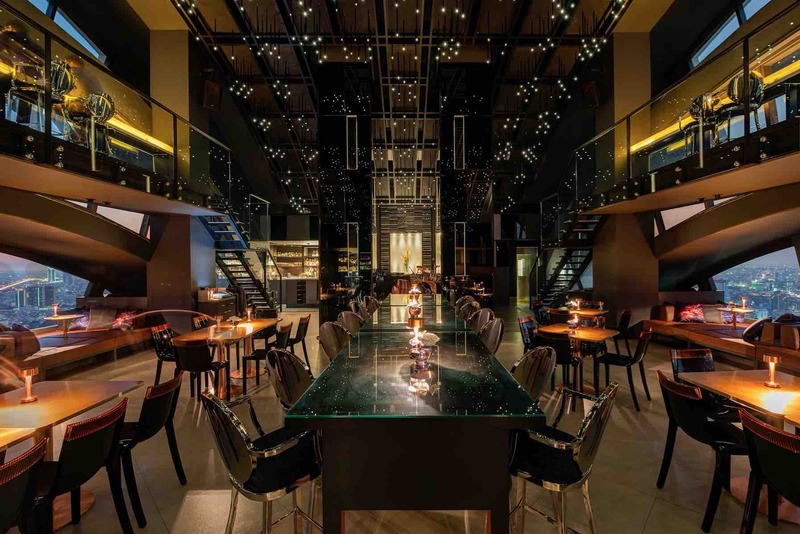 Vertigo offers an array of international cuisine, allowing you to choose from the main a la carte menu or from a selection of custom crafted set menus. On our visit there, we were offered one such set menu, featuring three courses complete with wine pairings. To start things off, a refreshing appetizer of Spiced Ahi Tuna Ceviche was brought out. 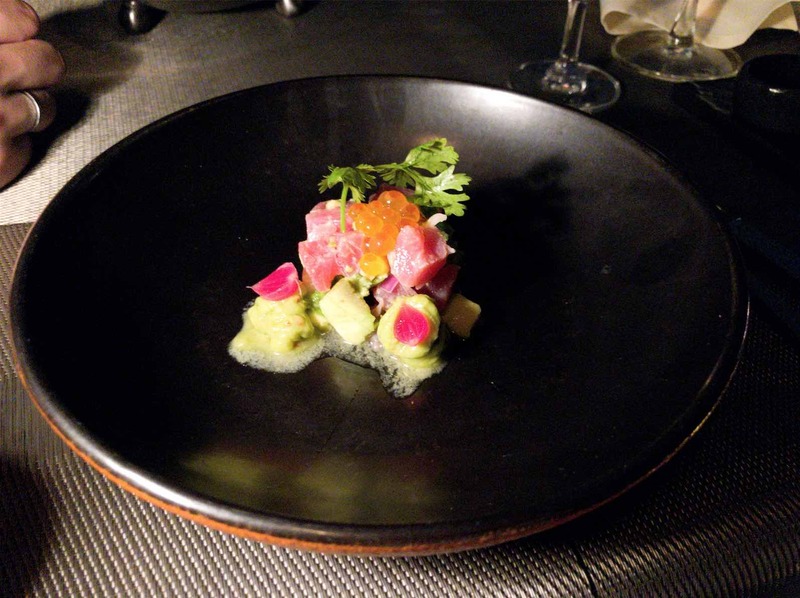 The raw fresh tuna, topped with avocado, coriander, lime, chillis, shallots and salmon roe, was perfectly seasoned with a good balance of sweet, sour and spice. The umami and flavourful salmon roe was also an excellent pairing with the clean-tasting sashimi-grade tuna. 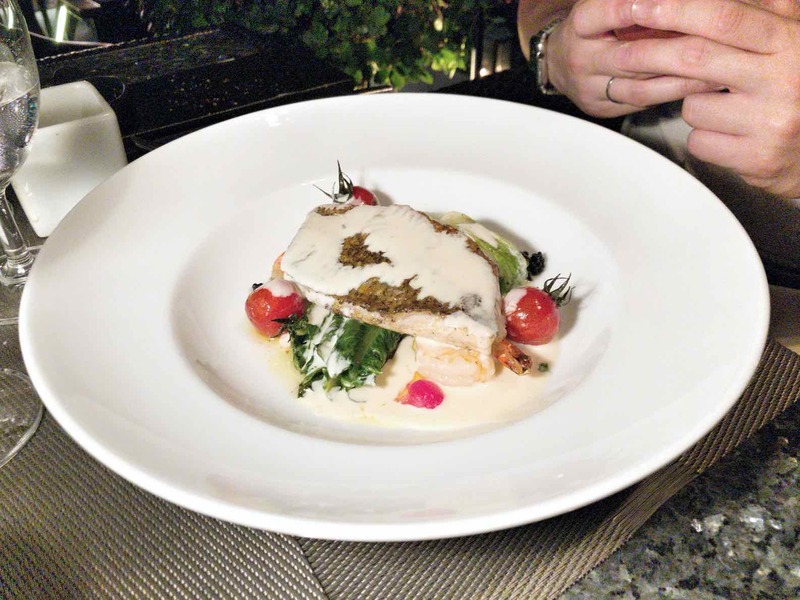 and fresh Australian Barramundi Fish, pan roasted with minted potatoes, lettuce, brown shrimp and a caviar cream sauce. 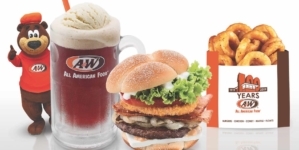 Naturally, we tried one of each, with both equally well done. 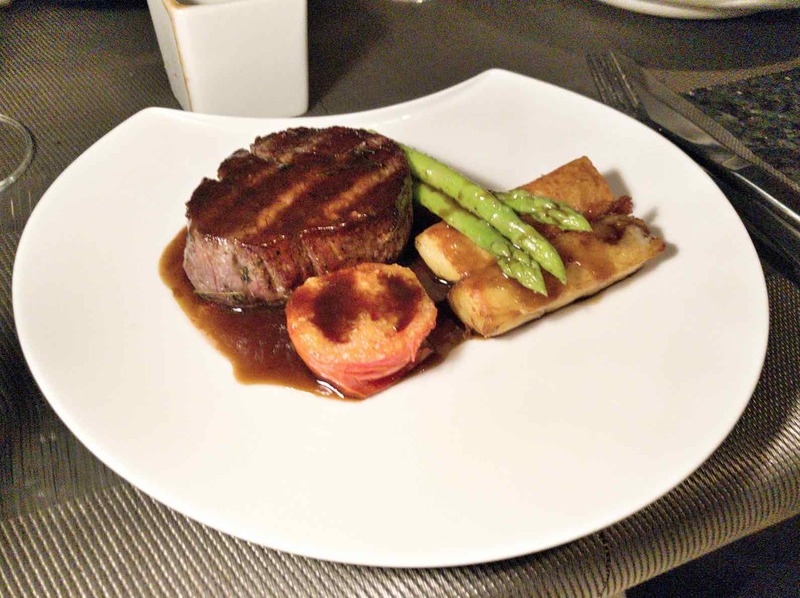 The beef steak was juicy, tender and rich in flavour, perfectly complemented by the tart sweetness of the tomatoes and the creaminess of the sauce. The fish was seasoned just right as well, pairing well with the potatoes that were just lightly hinted with mint. To wrap the meal up, we were served Vertigo’s signature Lemon Verbena Crème Brulee, served with honeycomb and citrus granita. 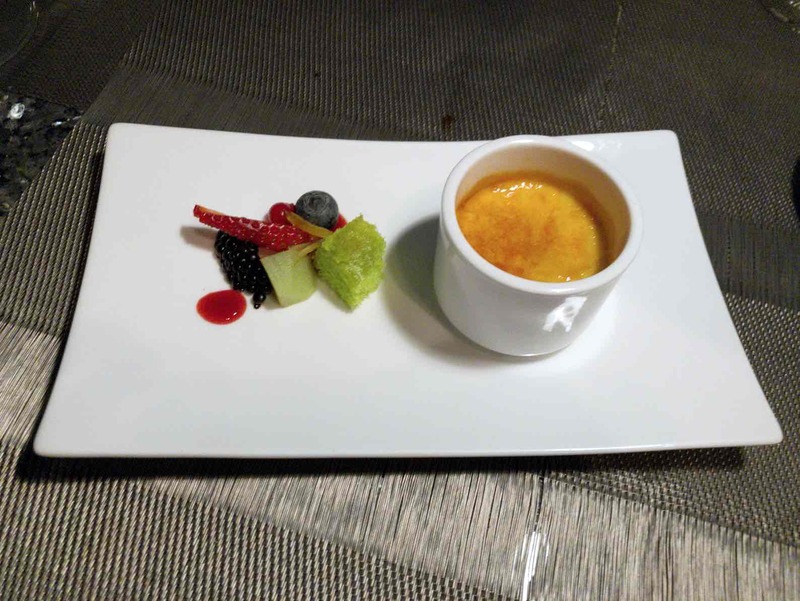 The dessert was well balanced, with the Crème Brulee itself creamy and smooth, and the citrusy sugar glaze on top providing a nice crunch. It paired well with the sweet lychee-hinted Moscato dessert wine that was served together with it. Excellent as the food was, what really set apart the Vertigo experience for us was the signature Banyan Tree hospitality. Throughout the dinner, the staff were on hand and alert to our every need, constantly refilling water and enquiring into the quality of the food and the overall experience. 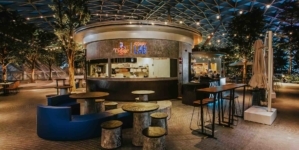 Just to note though, as a relatively formal restaurant, don’t expect to get in dressed like you’re going for an afternoon at Chatuchak Market – no sleeveless tops or shorts at this place (the restaurant has some jackets and pants on hand to loan to you if you really forget though). And if the idea of an evening dressed up like that in the alfresco Bangkok heat puts you off, not to worry because Banyan Tree Bangkok has you covered – Vertigo TOO (which we, unfortunately, didn’t get a chance to try) is an indoor restaurant and bar one floor below Vertigo which offers much of the same amazing view, except in a cozy and plush indoor setting. 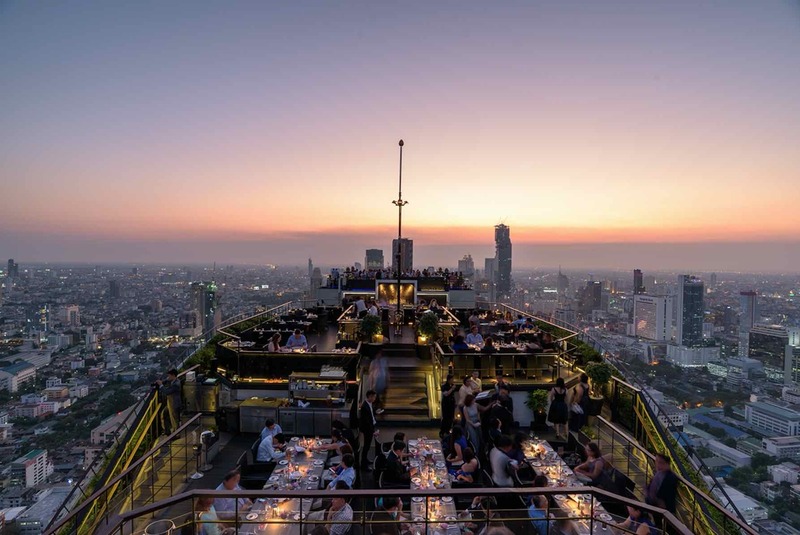 Vertigo and Moon Bar is located on the 61st floor of the Banyan Tree Bangkok. Vertigo opens daily for dinner only from 6pm-11pm, while the Moon Bar opens from 5pm-1am. Opening hours are subject to weather conditions. For more information or for reservations, call +66 (0)2 6791200.